Lord Alaric Wilde has spent years traveling and writing about his dangerous adventures. Back home, he’s become a big celebrity and his portraits hang on many ladies’ bedroom walls. But when he returns home for his brother’s wedding to find he now has to fight hordes of adoring fans, he can’t seem to get the attention of the one woman who interests him. I usually love modern day issues set in historical times like in this case with the celebrity life and the invasion of privacy and made up stories that follow Alaric. WILDE IN LOVE had a fun and unique plot that I haven’t really seen done before and mixed that in with a fake relationship as well, which is a favorite theme of mine. It was a sweet tale of friendship, bonding and eventually love that I found enchanting. 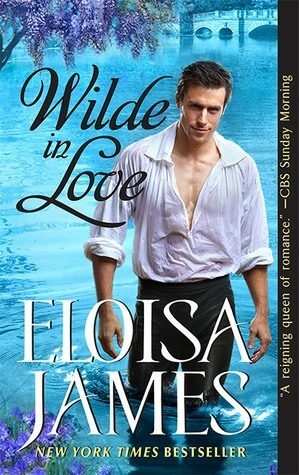 Eloisa James developed her characters well (including the supporting cast) and I honestly fell for both of them. Willa is very determined, confident and clever. At the same time she doesn’t come across as too strong-willed and I found that her character was the perfect match for Lord Alaric. While I liked the characters individually and I think they are quite perfect for each other, I think the pacing was a bit unsteady and I went from really being into it to feeling that engagement waning at other times. Overall, there’s a nice mix and this ended up being an enjoyable read that introduced us to a new set of characters that I’ll be excited to read more about. I’m looking forward to the next in the series, which was very well setup in this one and I’m hoping it will have a little more depth and chemistry than this first installment. Great review Francesca! Shared on all my socials! !